Sign up now for Dr. Andrea’s “Detox Your Thoughts” Buzzfeed/Goodful challenge! Dr. Andrea chats LIVE every Tuesday at 1pm EST for The Washington Post. It is like a live, written column-- and she and her chatters talk about everything from family drama to emotional baggage to work and relationships in "Baggage Check Live." It's free, it's anonymous, and there's no sign-up required. And you can read the chats anytime after they're done. Read now! Author of a best-selling book on psychological principles, featured columnist for the Washington Post, Psychology Today and Huffington Post, adjunct professor at Georgetown University, and media personality, Dr. Andrea Bonior brings psychological science to life. Through her talks, press appearances, and writing, she provides actionable insights into overcoming real-world challenges, and explores how research-backed techniques can help us achieve the lives we want, personally and professionally. A licensed clinical psychologist with a long-time practice in Bethesda, Maryland, Dr. Bonior speaks across the nation to help organizations improve workplace relationships, motivation, and emotional health. Through cutting-edge research on the principles of behavior, participation-based exercises that engage her listeners, and examples that are fine-tuned specifically for each audience, Dr. Andrea Bonior delivers compelling talks that explain how it's sometimes the seemingly "little" things that can actually make the biggest difference in our motivation, energy, and happiness. Participants take away a far better understanding of their mental blocks and motivators. They leave inspired by a whole new toolkit of cognitive techniques, energized and ready to be more effective in overcoming professional and personal obstacles. Dr. Bonior is available for corporate and non-profit audiences large and small, and her talks are particularly well-suited to entrepreneurs, health care providers, HR professionals, corporate managers, teachers, and sales teams. She specializes in keynotes, workshops, and half-day trainings. Treat your attendees to an educational, inspirational, and mentally stimulating session with Dr. Andrea. Build better relationships by breaking down barriers that get in the way of communication. Create stronger teams and more effective leaders through better insights about how to relate-- smarter. Discover the science behind our connections to other people, and troubleshoot the problems that sometimes make them toxic (ouch!). Discover the surprising ways that social connections and friendship are crucial not just for emotional health, but for physical health as well. Learn how to cut out the clutter and create meaningful interactions in the age of social media. Effectively address stress and mental health concerns, drastically decrease burnout risk, and learn the connection between wellness and productivity. Identify problem spots that put the mental health of your organization-- and its employees-- at risk. Bust the myths about productivity and learn actionable tips and techniques to overcome procrastination, increase efficiency, set more effective goals, and track your progress to keep it going. Understand the surprising difference between happiness and pleasure, and learn how to better connect with your purpose and values to increase your day-to-day satisfaction. Incorporate mindfulness into your workday and leisure time, and integrate some research-backed happiness boosters that will absolutely blow your mind. Dr. Andrea is the author of the Publishers' Weekly bestseller, Psychology: Essential Thinkers, Classic Theories, and How They Inform Your World. It explores how famous, not-so-famous, and downright infamous psychological principles apply to our everyday lives and relationships. By exploring 37 of the theories and approaches that formed the basis of modern psychology, Dr. Andrea Bonior bridges the gap between the theoretical and the practical, and lays the foundation for better understanding of your own everyday thoughts and behaviors. Drawing from decades of clinical experience, Dr. Bonior uses enlightening anecdotes, modern research, and a healthy dose of humor to explore the interesting, fun, engaging, sometimes-challenging, dramatic, and constantly evolving relationships we have with our friends and acquaintances. Discover how current technology and social networking have rewritten the rules around friendship-making, friendship-keeping, and friendship-breaking. 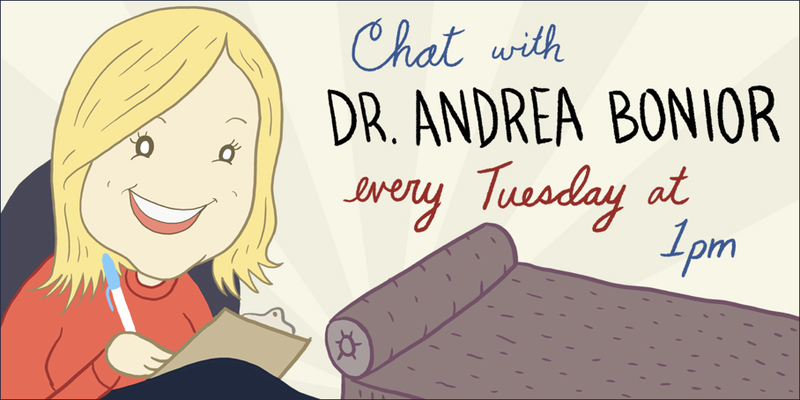 Every Tuesday, we send out news about what Dr. Andrea is talking about that week, and a reminder to join us in the live chat to say what's on your own mind! Don't want to miss the discussion? Sign up now. Get Dr. Andrea's insights delivered to your inbox every Tuesday. Discover what makes you tick! We respect your privacy. Seriously. In fact, we're kind of obsessive about it. Dr. Andrea specializes in life transitions, anxiety, and relationships, and draws from her extensive knowledge and experience to help her patients overcome psychological challenges. By creating a space that feels safe and protected, Dr. Andrea helps her clients resolve challenging obstacles, including depression, anxiety, grief and loss, and interpersonal problems. “Are you tired of feeling stuck? It's easy to put off getting help. But when you're in a bad place emotionally, in time it can take you further and further from the life you want." To schedule Dr. Andrea for your next corporate presentation, keynote, conference, or seminar, please submit this form. We will respond as soon as possible, and look forward to making your next event a huge success.